Created in Singapore in 1969, Mokara is a trigeneric hybrid of Vanda, Arachnis and Ascocentrum, combining the most outstanding characteristics of each. The heir to three legacies of beauty, this orchid boasts a burst of superb, star-shaped blossoms, displayed here as a bouquet of 15 stems of the crimson-hued variety. 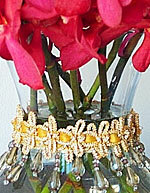 The delicately beaded vase is another Beautiful Orchids exclusive. 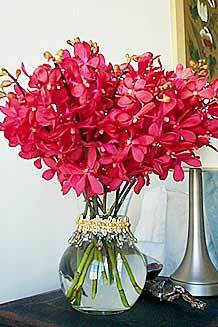 The arrangement above was created with 20 perfect stems of freshly cut Vanda-Mokara in our Bella Lucca vase. Each purchase includes care instructions and an exquisite gift card for your personal message. Each stem is approximately 10-13 inches tall bearing 12-16 blooms and comes with individual water vials. 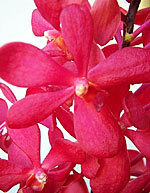 The flowers measure approximately 2-3 inches in diameter.